A clogged drain can quickly turn into a major problem for any home or business owner. As careful as you may be about taking care of your drainage system, it is often inevitable that over time, debris and material will collect inside the pipes and block the flow of water. At NuFlow Phoenix, our trained technicians can flush away clogs, tree roots and even mineral build up through quick and efficient methods of drain cleaning. Soap scum, hair, grease, and bits of food are regularly passed down our bathroom and kitchen sinks. These eventually start sticking to the inner surface of the pipes, trapping more debris over time and slowly growing into an obstacle in the way of wastewater flowing down these drains. Chemical cleaners are a temporary fix that actually ends up causing long-term damage to your pipes. Professional cleaners, however, are a better choice that can rid you of this problem in an extremely environmentally friendly manner. Regular drain cleaning is an important home maintenance task that is often neglected. It is easy to ignore the plumbing system in your house, as it is covered by the walls and floors. As long as the sinks are draining and the toilets are flushing, you might think that everything is fine. In many cases, it is always easier to get rid of a small clog than to have to deal with one that has completely blocked the pipe. Once the pipe is blocked, the water pressure will increase. If the pipe is old this can cause it to crack and leak, or even burst,leading to an expensive repair or replacement. Plumbing snakes and similar tools are good for poking a hole into the clog, which will let the water pass, giving a false impression that the problem has been solved, when in reality the obstruction will soon close up again. For tougher buildups, we have plumbing snakes that have a set of blades on their end. Once they reach the clog, they rotate rapidly, cutting up the obstruction into tiny pieces. All our staff is highly trained and ready to use these and other drain cleaning tools, always selecting the best one for cleaning the drains and sewer line in your home or business. After inspecting your drains through an access point, our technicians will tell you what sort of a clog you are dealing with and how large it is, as well as the best method for eliminating it. 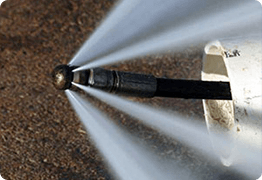 Hydro jetting is the process of blasting a high-pressure stream of water through a special nozzle. Our technicians use the pressure of the rotating water that is being forced into the pipe to remove the toughest buildups and obstacles. On the end of the hose is a nozzle that directs water towards the interior walls of the pipe. As the hose pushes forward, the backflush of the water draws the debris out of the pipe. Our team is full of experts and specialists who are fully capable of using the hydro jetting equipment effectively. As a result, hydro jetting is a quick, economical, and environmentally friendly method of drain cleaning, as well as being a long-term solution for the frequent blocks and clogs any household faces. It doesn’t just unclog your pipes but also leaves them completely clean for future use as well. Our hydro jetting technology is that the procedure also ends up cleaning out any bacteria that has built up in your drains. Removal of these bacteria refreshes your pipes and leaves them free from any pungent odors, keeping you safe from potential health hazards and infections. Call NuFlow Phoenix To Get Your Drain Lines Cleaned Today! Call us now at NuFlow Phoenix and schedule an appointment with our trusted team to clean your drains. Our hydro jetting process will eliminate the need for repeated sewer cleaning services and leave your pipes clean for several years ahead.